Thanks to that U.S. dollar rally yesterday, USD/CAD surged past the 1.0300 handle. However, it still fell 10 pips short of my adjusted profit target at 1.0350. I’ve been holding on to this trade for almost a week already so I think it’s time to close out and be happy with my winnings. 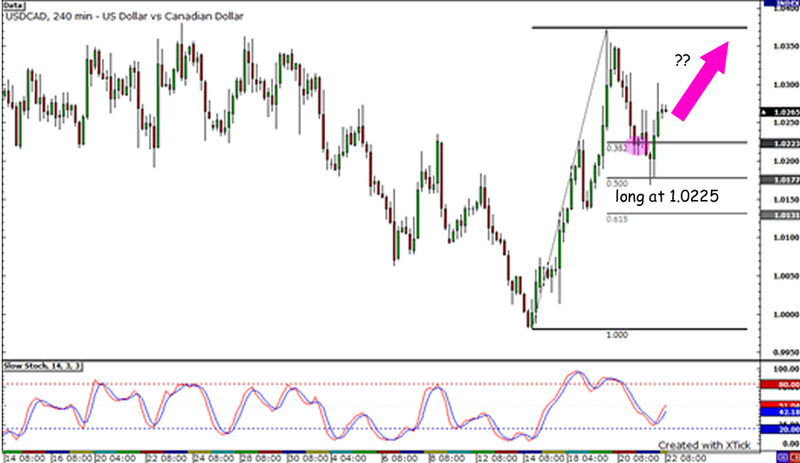 Besides, my NZD/USD long trade got triggered and I’m getting goosebumps about holding opposing dollar positions. Hopefully I made the right decision in choosing which trade to close. I know, I know… I could’ve made much more but, hey, a win is still a win! Yipee, I’m up! For now, that is! I know that I might seem a tad too giddy about my 30-or-so unrealized pips. But you have to understand, I’m always on a chocolate high but haven’t been on a pip high for quite a while now. Anyway, USD/CAD seems to be consolidating around the day open price at 1.0264 which seems to be a minor support and resistance level. But I think I’ll wait for USD/CAD to stage a strong break past 1.0300 before I move my stop loss to breakeven because I’m still wide-eyed and hopeful for Canada’s retail sales and CPI reports to reel me in the pips I’m aiming for. I’m scared that if I do it too early, I may get stopped out with a spike. Yikes! Aaand I’m back! I’m back to trading the Loonie that is. But unlike last week, this time, I’m not gonna root for the com-doll anymore. 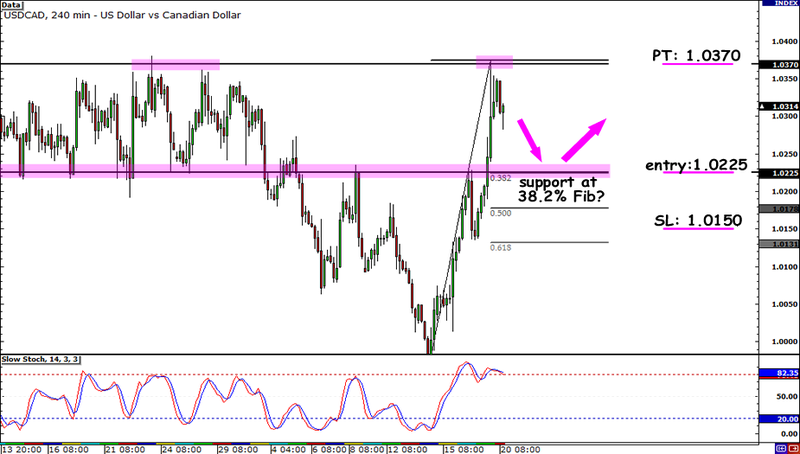 I’ve got a few reasons up my sleeves why I’m bearish for the Loonie. The first one, as mentioned by Pip Diddy in his blog, is the BOC‘s shift to a more dovish stance in its monetary policy. I bet a bunch of my friends in the FX hood are still upset with the central bank keeping borrowing costs pegged at 1.00%. Yeah, I know this isn’t much of a surprise, but it doesn’t make the Loonie look sweeter than a Butterfinger to the bulls either. What did come as a surprise was China’s rate hike yesterday which was one of the factors that caused the com-dolls’ slide on the charts. See, now there’s renewed threat of a slowdown in global demand because of the increase in borrowing costs in China. And that’s one more reason for traders not to show the Loonie some love. I have a feeling that the bad vibes for the currency will continue later when the BOC releases its monetary policy report. Why? Well, the report will most probably give the market a better taste of the bitter reasons why the central bank lowered its growth forecast for 2010. I’m can already hear the not-so-so giddy remarks about the decline in employment and consumer spending, and the slowing recovery in the US which is one of Canada’s major trading partners. If this won’t reel me in some sweet pips, then maybe the CPI report on Friday will. Remember that the BOC has hiked rates for three straight months before it announced a pause in October and that might have been enough to tame inflation. Aside from that, the 4-hour chart reveals a nice area of interest around the 1.0200 to 1.0230 area. Notice how that zone switched from being a support level to resistance? Well, I put up some Fibs and noticed that the 38.2% retracement level lines up with that! I set my stop just below the previous week high of 1.0184 and my profit target close to the previous day high of 1.0373. 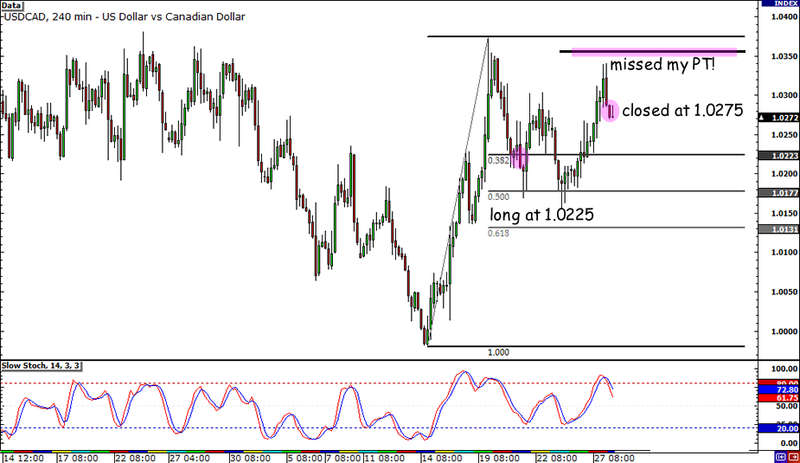 Long USD/CAD at 1.0225, stop at 1.0150, profit target at 1.0370. That’ll give me a nice 1:2 risk reward ratio… well, almost! As always, I’ll risk 1% of my account on this trade.